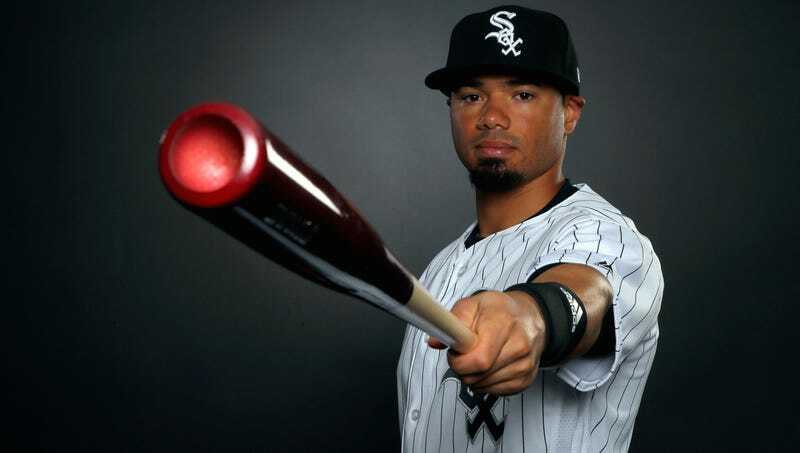 Going into tonight’s game against the Cleveland Indians, Chicago White Sox outfielder Jacob May, who won a tough competition for the team’s center-field job this spring, doesn’t have a hit yet this year in 24 at-bats—the first 24 of his major-league career. “I’m not the only one that’s ever started off slow like this,” May told Deadspin writer Hannah Keyser’s better half. As the AP details, May’s grandfather Lee May started his career much less slowly before going on to gather more than 2,000 hits in the majors. “You hope the baseball gods smile on him here soon and he gets at least a bleeder,” White Sox general manager Rick Hahn told Mr. Keyser. Update, 10:54 PM: May continued to struggle to make contact tonight. He sharply grounded into a double play, walked, and struck out with a man on and his team down three in the bottom of the ninth. Disclosure: The author of this piece has been provided Gordon Beckham’s used footwear by the Chicago White Sox. His opinions are his own.